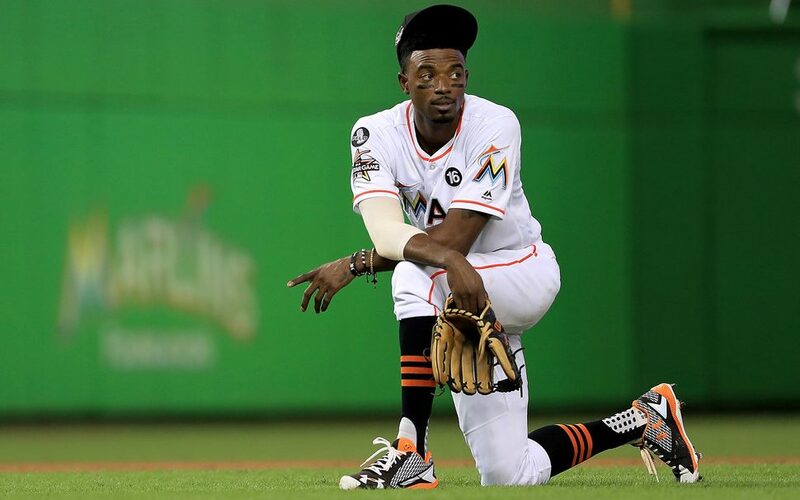 If the Marlins Are Open for Business, Should the Blue Jays Shop for Stanton and Gordon? In the winter of 2012, the Toronto Blue Jays and Miami Marlins got together and completed a 12-player blockbuster trade that shifted the landscape of both franchises. Five years later, the Marlins are poised to be open for business yet again. Could the two clubs match up for another trade this winter? According to Barry Jackson and Clark Spencer of the Miami Herald, another fire sale may be on the horizon in the near future. With a new ownership group motivated to slash payroll, the Marlins could look to offload some of their bigger contracts. They mentioned three key players the Marlins would be interested in dealing: Giancarlo Stanton, Dee Gordon and Martin Prado. While the Blue Jays should steer clear of Prado (who’s entering his age 34 season), Stanton and Gordon would fill clear needs for the Blue Jays. In regards to Stanton, I can’t even begin to describe the hurdles the club would need to clear to acquire his services. With $295 million left and 10 years remaining on his existing deal, it’s an extremely tough sell to the front office. There are very few teams around baseball who would be willing and able to take on that contract. Even if the Blue Jays could scale that down by sending something back to the Marlins, the financial commitment is staggering. But if we put the money aside for just a moment (it’s only $295 million), Stanton is coming off the best season of his career. He may very well win the NL MVP Award this year. In his first fully-healthy season since 2011, Stanton finally put it all together for a monster campaign. I can’t think of a more impactful move the Blue Jays could make this offseason than going out and getting Stanton to play right field. The Blue Jays have an opening in right field next year; why not fill that gap with one of the biggest power hitters in baseball? It’s hard not to salivate when you start to think about what Stanton could do going from one of the most pitcher-friendly parks in Miami to a home run haven in Toronto. One of the downsides of the Blue Jays going after Stanton is it’s difficult to imagine an ecosystem in Toronto where he and Josh Donaldson coexist long term. Meaning, taking on Stanton’s contract likely spells the end of any possibility of re-signing the Blue Jays’ third baseman. However, because of the dollar figure and term associated with that contract, it poses way too much of a risk for the Blue Jays. Stanton also needs to waive his no-trade clause to come to Toronto, which may be a tough sell. Although, at this point, anywhere other than Miami seems like a reprieve for Stanton. The next best deal the Blue Jays could strike with the Marlins? One for Gordon. Why not get Gordon Instead? To me, it just makes way too much sense. He fits the exact prototype of the player that Ross Atkins described during his end-of-season presser; a very good player who could play shortstop and second base. Gordon has extensive experience playing both positions as a plus defender. He’s also an incredible hitter, he fits the mold as the quintessential leadoff hitter the Blue Jays need and Gordon also provides as great deal of speed to a team which is significantly lacking on the base paths. By acquiring Gordon, the Blue Jays would check off a lot of boxes on their offseason shopping list. Now it’s true that speed doesn’t age well and Gordon is entering his age 30 season (and the Blue Jays already have plenty of 30-something position players), but I can’t see his speed dropping off so much that he becomes a liability. Although, the memories of Jose Reyes’ diminished play at shortstop and his foot speed in 2014 and 2015 were a bit of an eye-opener to counter that point. According to Baseball Savant’s Sprint Speed Tracker, Gordon was the fastest second baseman in baseball last year. Among all position players, Gordon ranked fourth in Sprint Speed. Pure speed isn’t everything, but it’s a quality severely lacking on the Blue Jays roster. Forget the stolen bases for a second (he swiped 60 bags last season, by the way); what intrigues me more about his baserunning is his ability to take an extra base; to go first to third, second to home or even first to home. Gordon’s extra base taken percentage in 2017 was 60%. As a club, the Blue Jays’ XBT% in 2017 was a meager 38%. Gordon has a very reasonable $38.9 million left and is under control through 2020 (with an option for 2021). If the Marlins are truly in rebuild mode, he seems like the type of player they could easily offload and pick up some prospects. Unlike Stanton’s mammoth deal, the Blue Jays have the payroll flexibility to take on Gordon’s contract. They also have the prospect capital to land Gordon. The deal seems so obvious to me that it’s difficult to imagine the Blue Jays not acquiring him this winter. 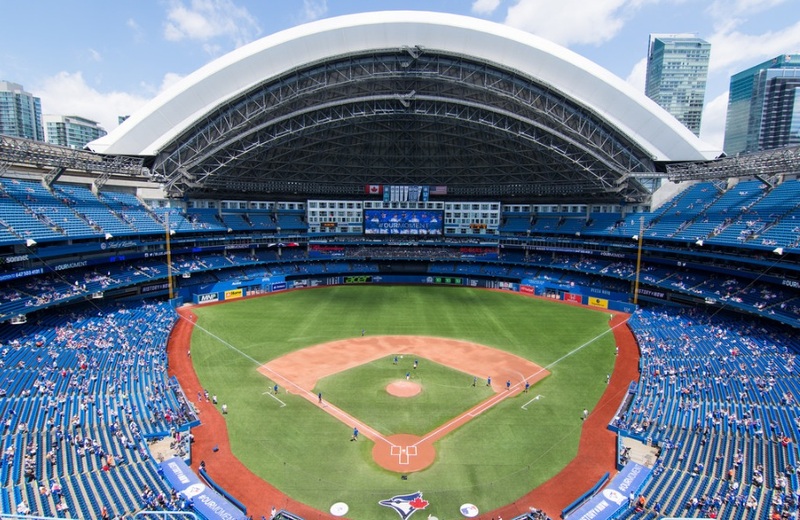 The biggest holes on the diamond for the Blue Jays are the corner outfield and middle infield. 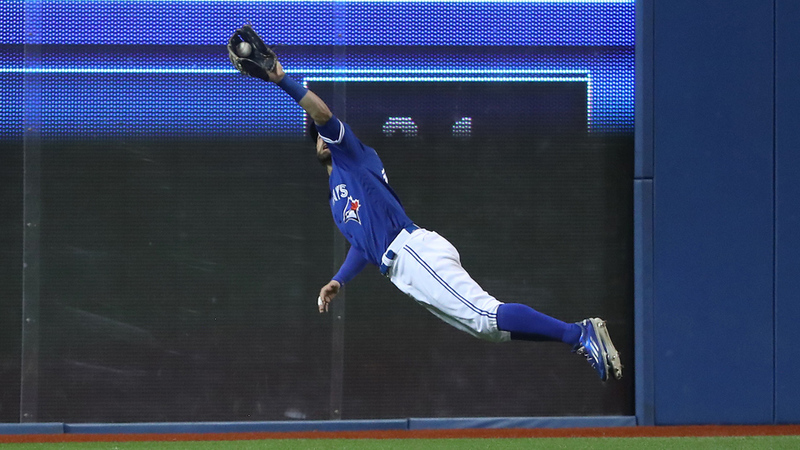 Troy Tulowitzki may be healthy for Opening Day – so too may be Devon Travis – but you almost have to operate under the pretense they won’t be healthy enough to start the season. Which is why a trade for a middle infielder like Gordon makes all the sense in the world. If one of those two aforementioned middle infielders are healthy enough to start, then shift Gordon to the other position. Even if Tulo and Travis are simultaneously “healthy” in 2018, they can’t be expected to play 150, 130 or even 110 games. There needs to be a solid, multi-positional backup and Gordon fits that description perfectly. Someone like Jason Kipnis or even Joe Panik also come with a similar skill set. Given the Marlins’ propensity to sell on players like Gordon, this is the right time for the Jays to make a move. 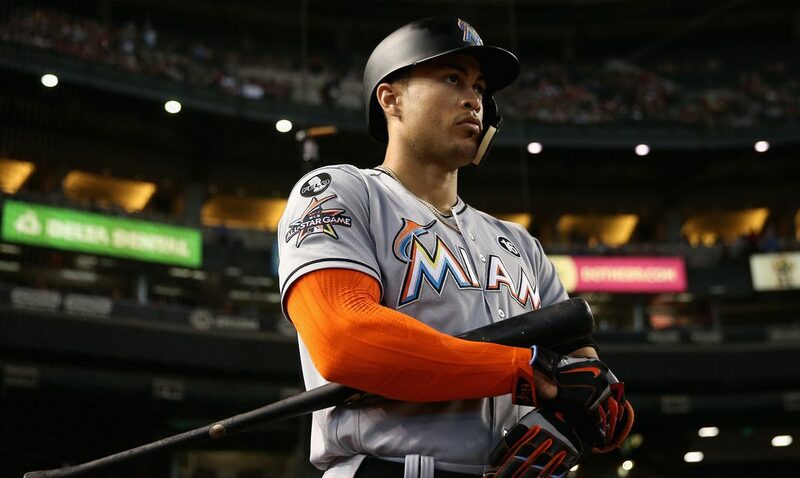 What Does the Giancarlo Stanton Trade Mean for the Blue Jays? Are there two Dee Gordons? The one I know has a career -21 DRS and -22.9 UZR/150 at SS. And most of that was from 2011-2013. Unless you believe that the +3.1 UZR/150 he put up over 16 innings at short in 2017 is some kind of epiphany, he is not a viable long-term option at short. My concern with Dee is that he is too expensive to ride the bench and he does not have a second viable position. So if Devo is healthy for ~130+ games (and performing at his career 112 wRC+ and +3.3 DRS/1000, both higher than Dee’s career averages) one of them would have to move (left field?) to a position at which they have zero mlb experience. The only way I see Dee working is if the Jays trade Devo, either as part of the Dee deal or in another move, locking Dee into the full-time 2B gig. I know he’s no Jose Altuve or Jose Ramirez, but Blue Jays second baseman posted a 67 wRC+ last year (second worst in baseball at that position). Blue Jays’ shortstops posted a 70 wRC+ last year (fourth worst in baseball). While not elite, Gordon would represent a marked improvement over what the Jays had up the middle this year. If for some reason all these guys stay healthy and the Jays go out and get someone like Gordon and there’s a glut at the position, they could make a trade … but considering how they hung onto Goins as infield insurance last year, I think the Jays would be weary to deal from their middle infield depth. Stanton has an out for the year in 2020. Jays salary would jump this year for Stanton by $25 MM and the same next year. Martin is gone after that and Tulo drops to $14 MM. Can Stanton salary replace Bautista’s projected salary. The trading of Martin would damage TBJ for next year, on the other hand, trading Tulo to anyone who would want him doesn’t seem to be happening.